Call it the million-dollar lie: Minnesotans are finding how costly it can be to allow vaccination foes to spread counter-factual misinformation in vulnerable populations. Doing so has helped fuel one of the North Star state’s worst recent outbreaks of measles among international refugees in the Twin Cities area. The highly contagious infection has swept through the state’s sizable community of Somali immigrants, felling several dozen children, most younger than 10 and all but two un-immunized. Public health officials blame the disease’s surge, which they say has not peaked yet and has resulted in kids sick enough to need hospitalization, on anti-vaxxers’ exploitation of immigrants’ uninformed fears about American medicine, particularly modern science’s inability to explain precisely what causes autism. To be crystal clear, no evidence or science ties vaccines to autism. But almost a decade ago, shortly after the government, churches, and nonprofits helped many Somalis—who were fleeing famine and strife in their native African nation and resettling legally in Minnesota—a public health scare erupted. The newcomers feared then that disproportionate numbers of their children were showing signs they were autistic. Health officials investigated and found no higher incidence of the developmental disorder. But that scare opened the door to anti-vaxxers, including Andrew Wakefield. He is a delicensed doctor who published a notorious and now repudiated and retracted study on autism and inoculations. Wakefield visited Somali communities in Minnesota, where he and his adherents campaigned among the relocating and disadvantaged immigrants, urging them to avoid shots for their kids, especially the MMR (the combination vaccine against measles, mumps, and rubella or German measles). Sure enough, as vaccination rates plunged among the Somalis, the measles began to spread. And contrary to the conventional wisdom that it’s a condition that kids endure and just sort of shrug off, with a bit of fever, runny nose, red eyes, and its distinctive rash, measles can cause serious complications, especially in children younger than 5. As the federal Centers for Disease Control and Prevention reports: One in 4 people in the United States who get measles will be hospitalized, while 1 out of every 1,000 infected with it will develop brain swelling, which could lead to brain damage. Even with the best care, 1 or 2 out of 1,000 people with measles will die. In a time of tight government budgets and spending, Minnesota public health officials have been forced to ask lawmakers and taxpayers for $5 million extra to deal with infectious diseases crises, with the current measles outbreak estimated to cost $1 million of that sum. 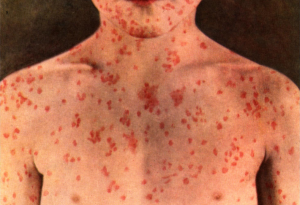 Doctors, nurses, and hospitals have gone into high gear, caring for the most seriously infected and trying to vaccinate more youngsters to contain the current measles outbreak and to prevent any others. Although the Minnesota episode may be one of the more severe to date involving infections and anti-vaxxers, outbreaks of measles, mumps, and whooping cough are occurring with disturbing frequency. A measles cluster with 145 cases, in Southern California, Mexico, and Canada, was tied to youngsters’ holiday visits to Disneyland—and reduced immunity due to anti-vaxxers wrong-headed crusading against appropriate inoculations for kids. In my practice, I see the injuries that patients can suffer while seeking medical services, and it is distressing to see how bad and negligent care injures babies and children. Vaccines carry risks, they are imperfect, and their advocates may exaggerate their effectiveness. But, collectively, we need to ensure we and our loved ones, especially our vulnerable youngsters, get immunized, if nothing else so we maintain our “herd” immunity. It might be easier, sure, to shrug and dismiss the anti-vaxxers as idiosyncratic neighbors with some odd views. But the Minnesota experience shows the real harms they inflict. It’s also troubling that ill-informed newcomers should bear the burden of their un-scientific nonsense. We all should call out and protect against this danger to the public health, and, yes, that includes President Trump and other truculent people of prominence.